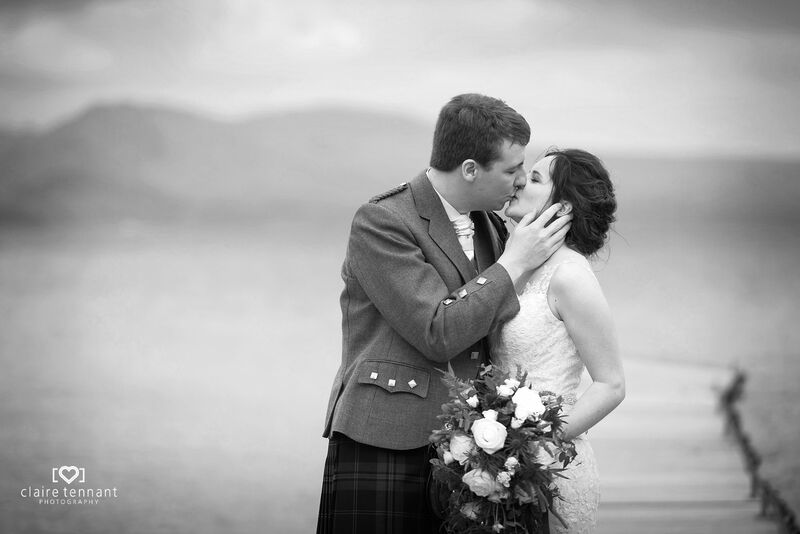 You may have noticed I’m jumping back and forth in time a bit on my blog! 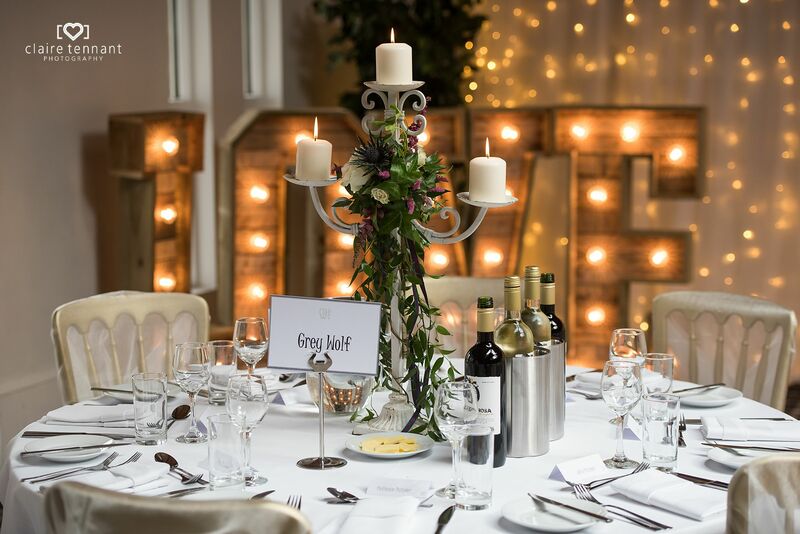 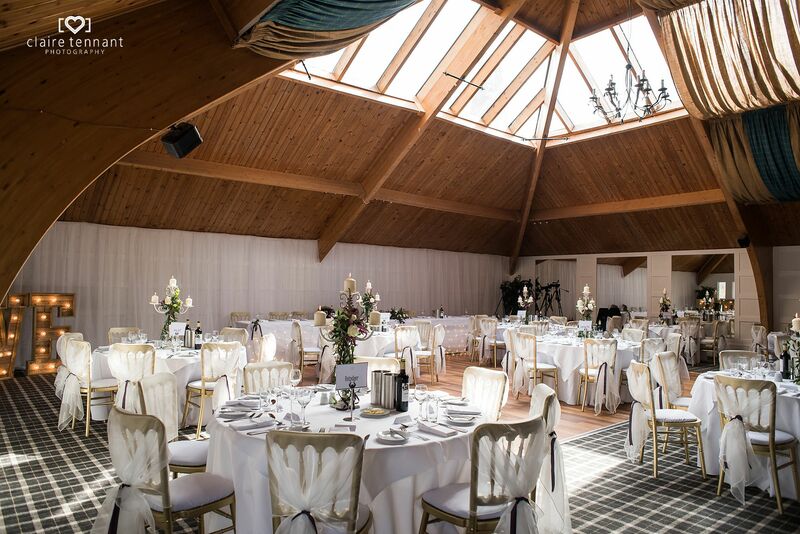 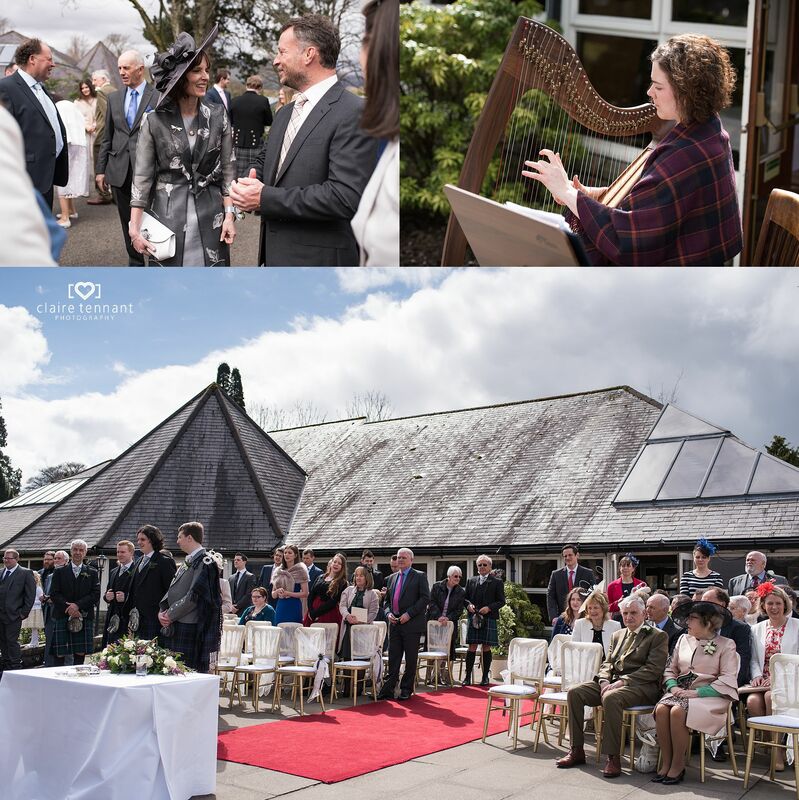 I’m focusing on venues I’ve not blogged about before and weddings which have something unique. 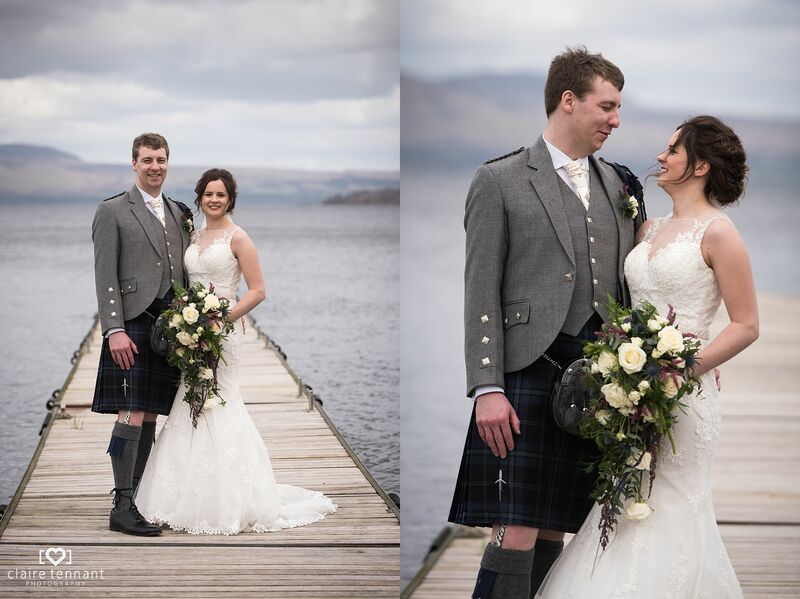 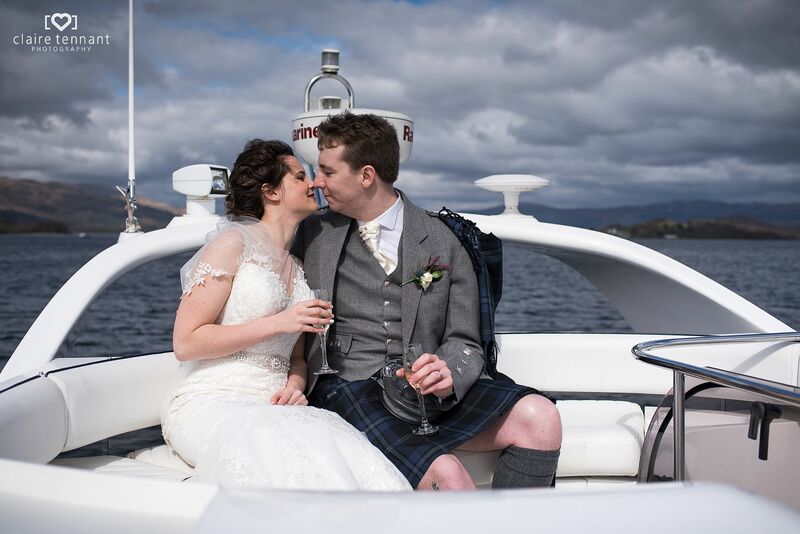 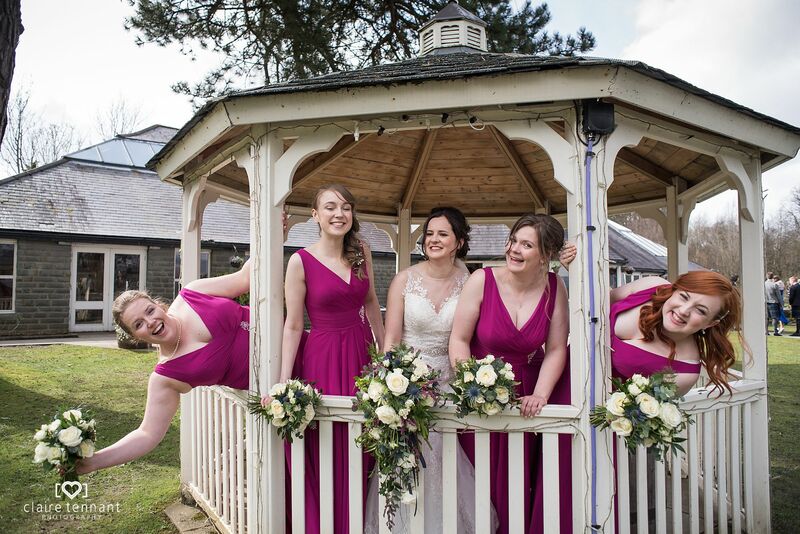 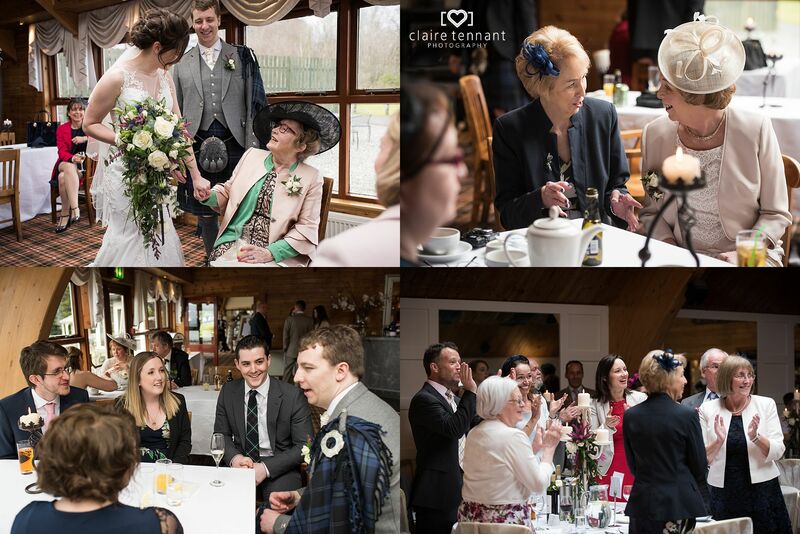 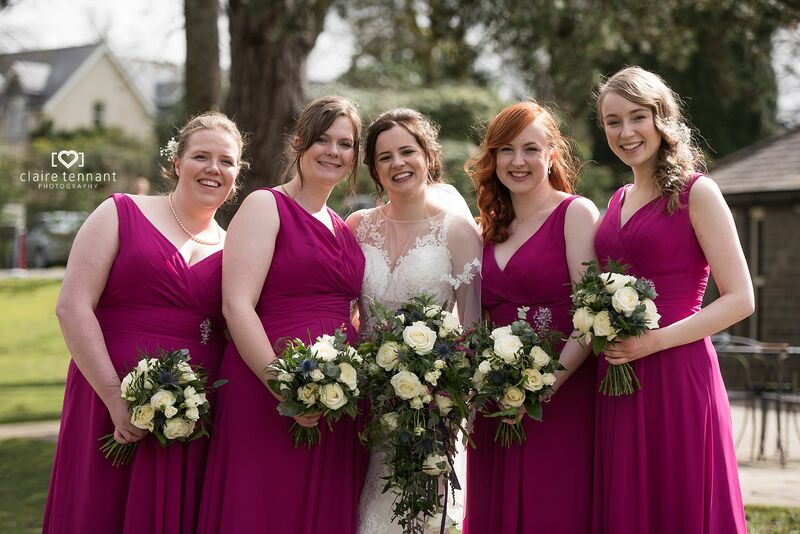 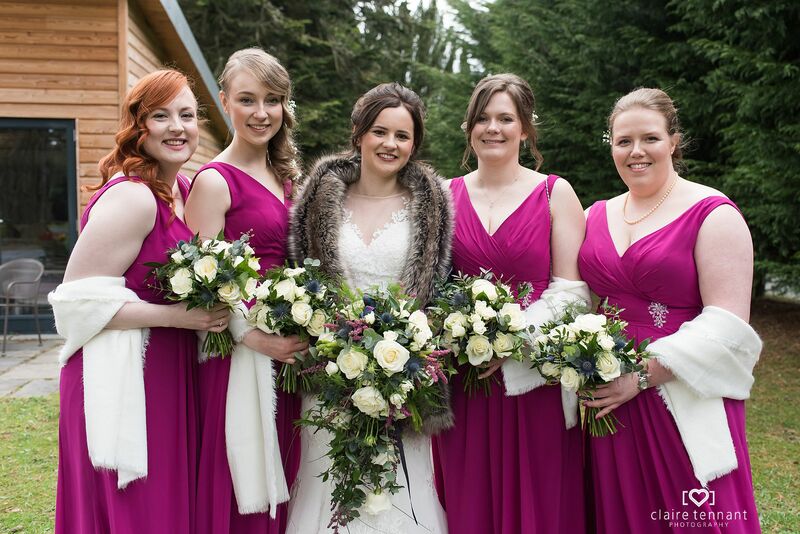 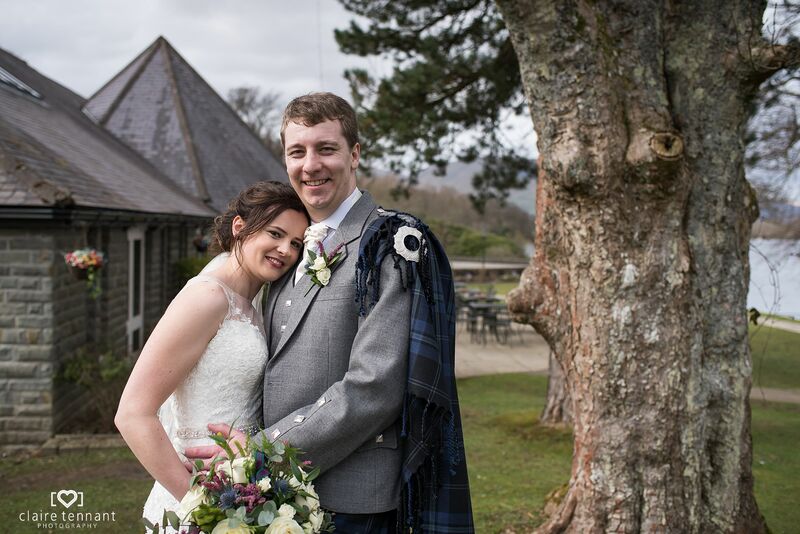 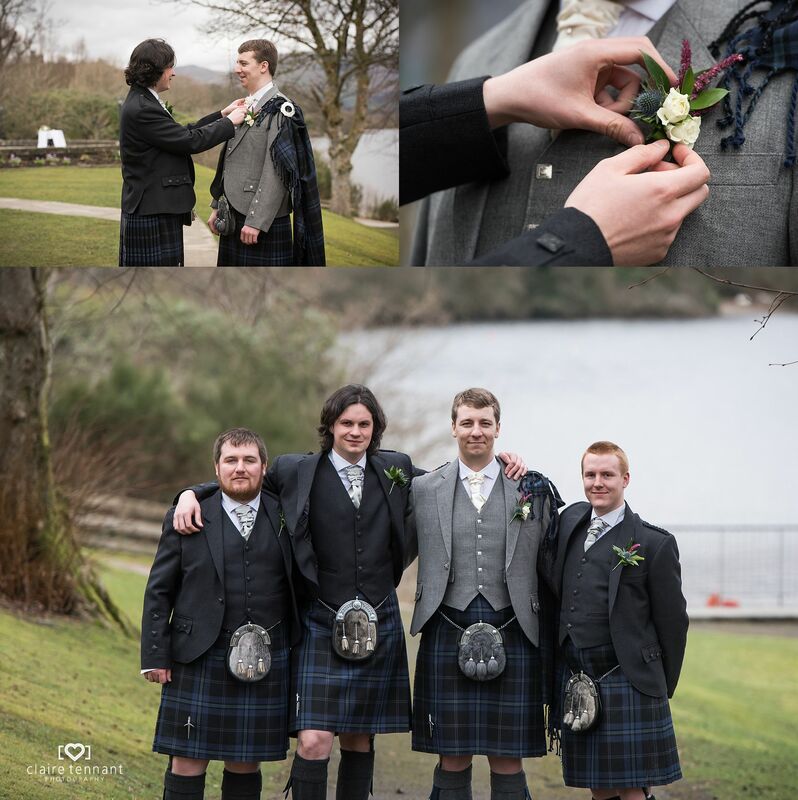 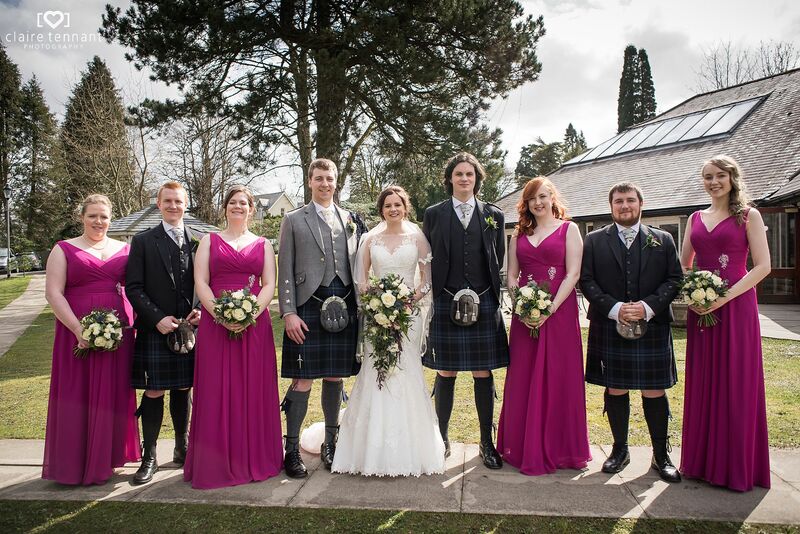 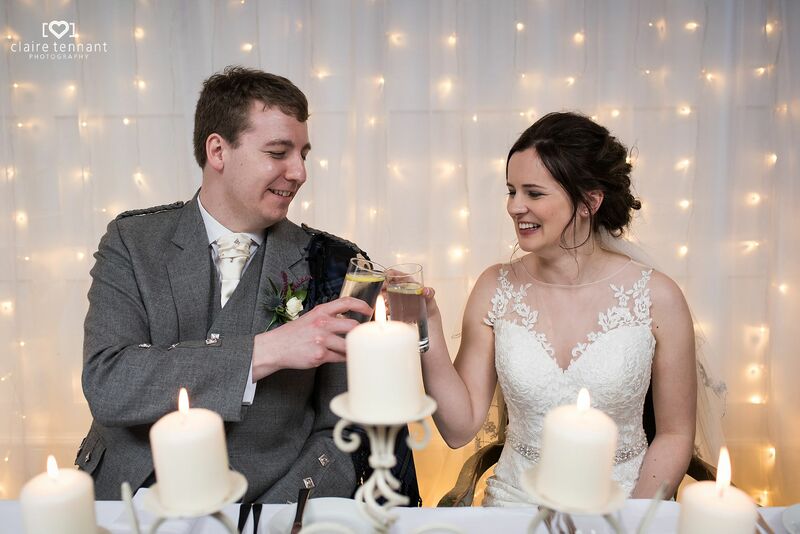 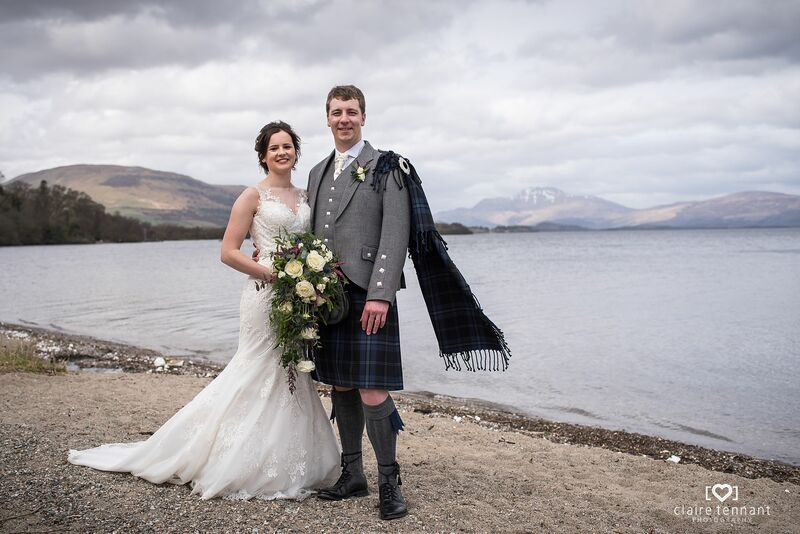 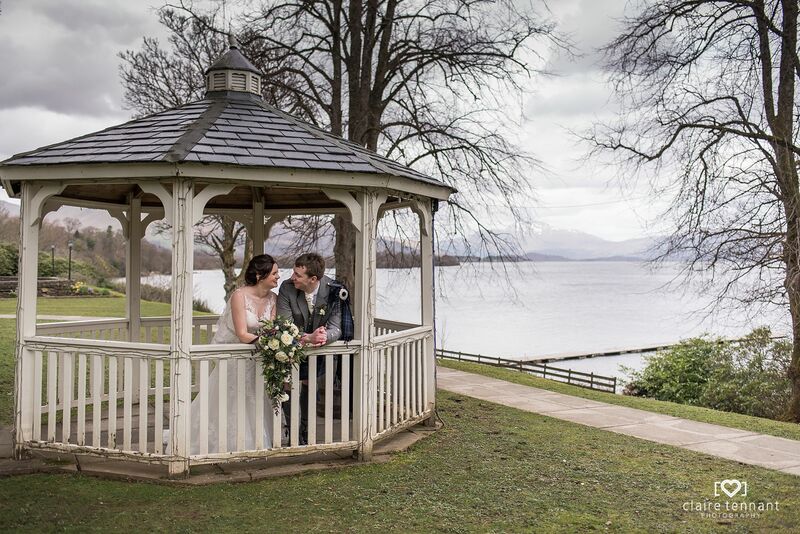 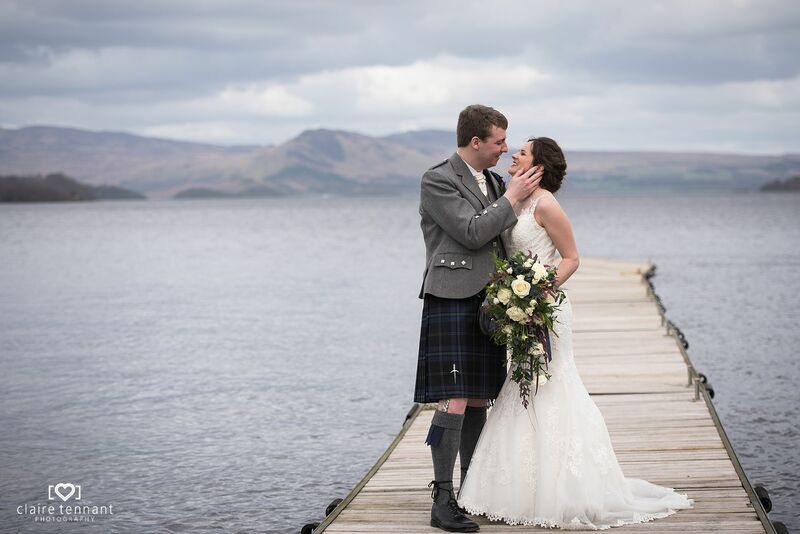 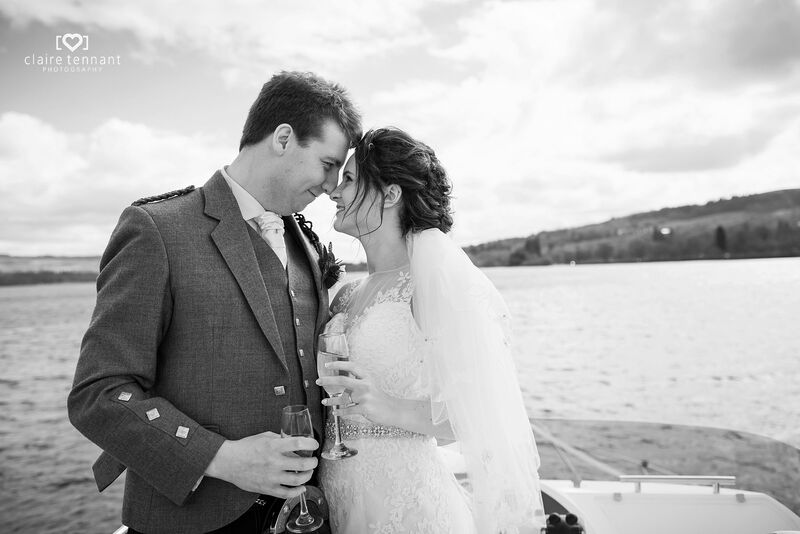 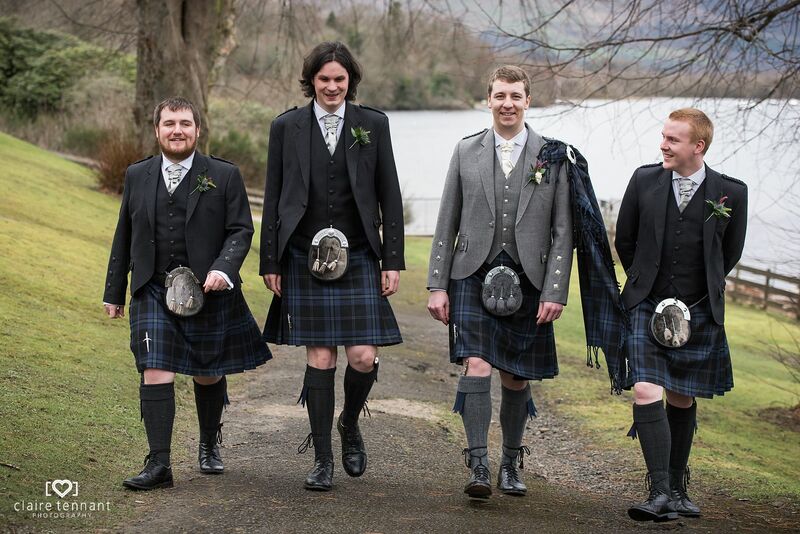 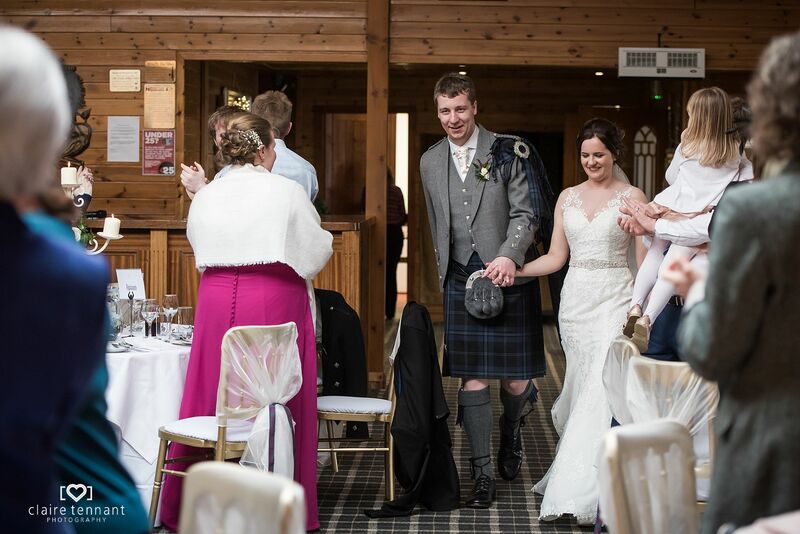 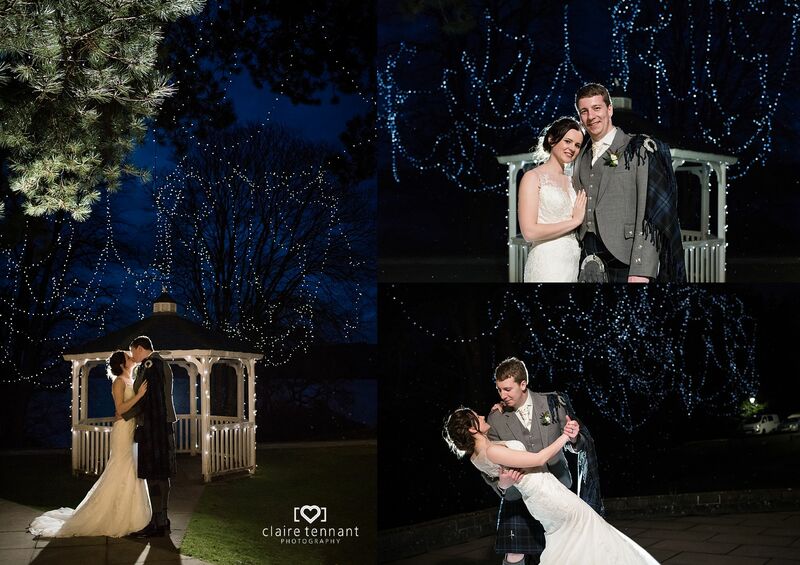 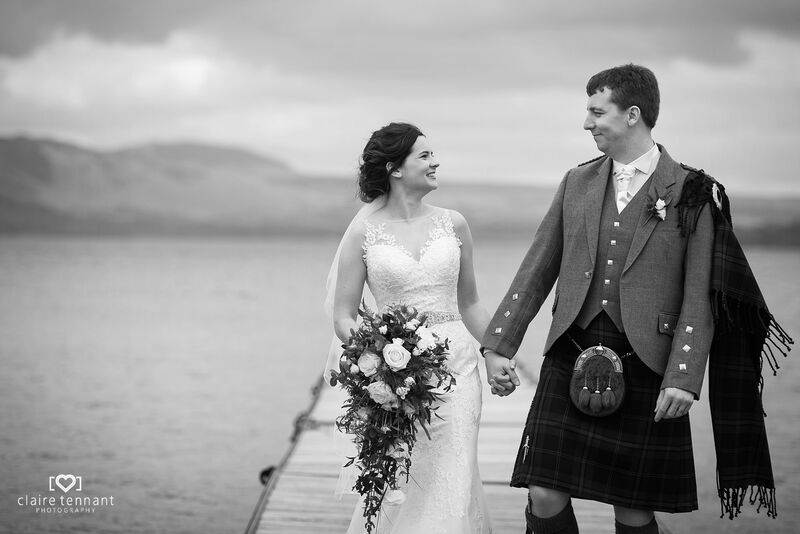 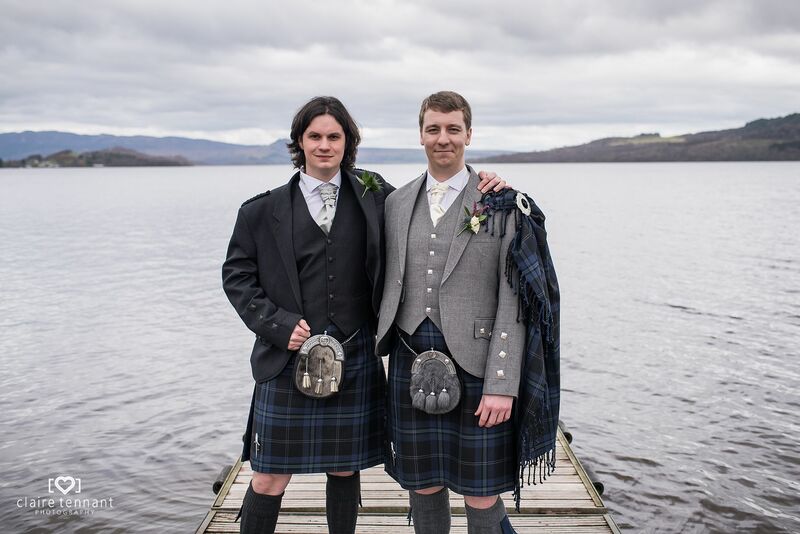 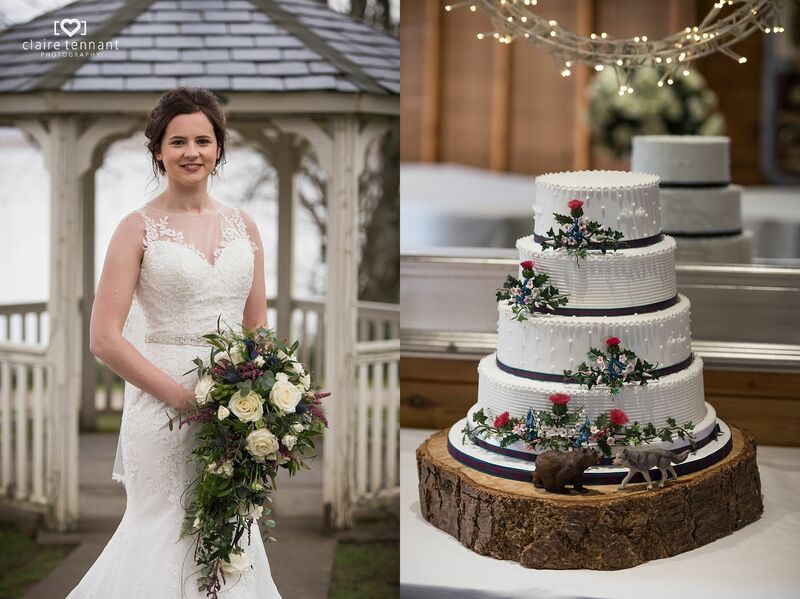 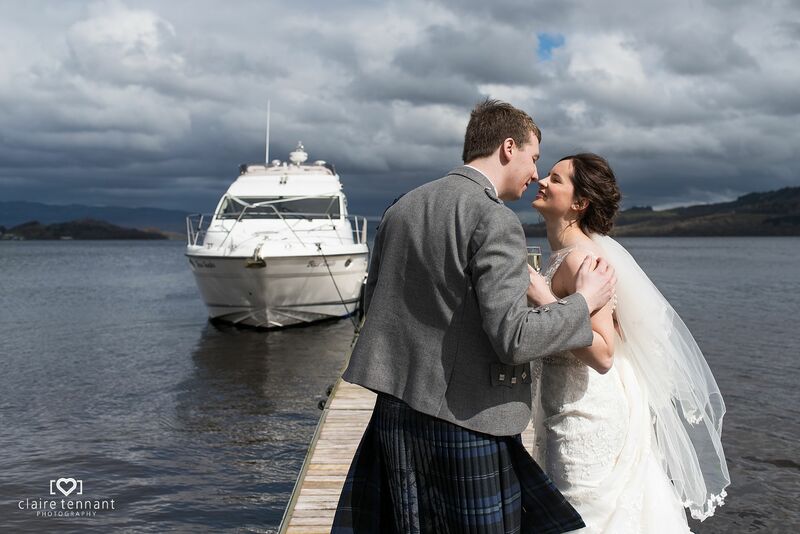 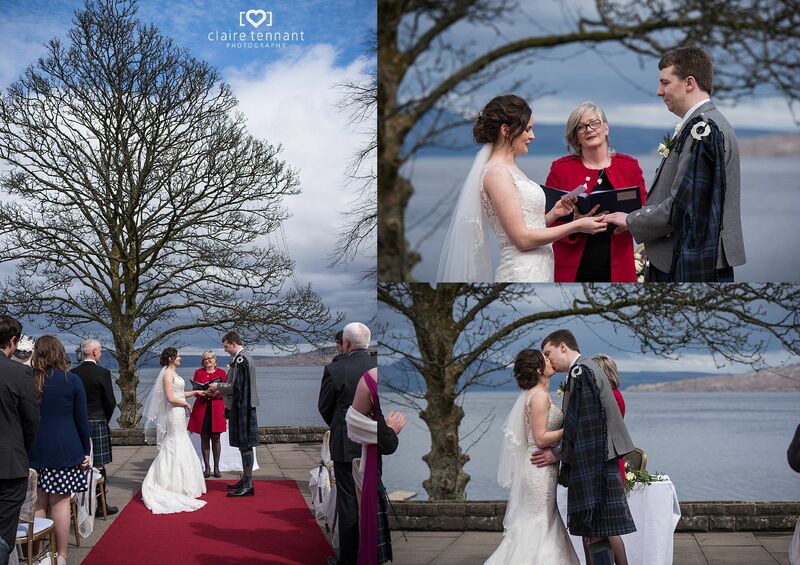 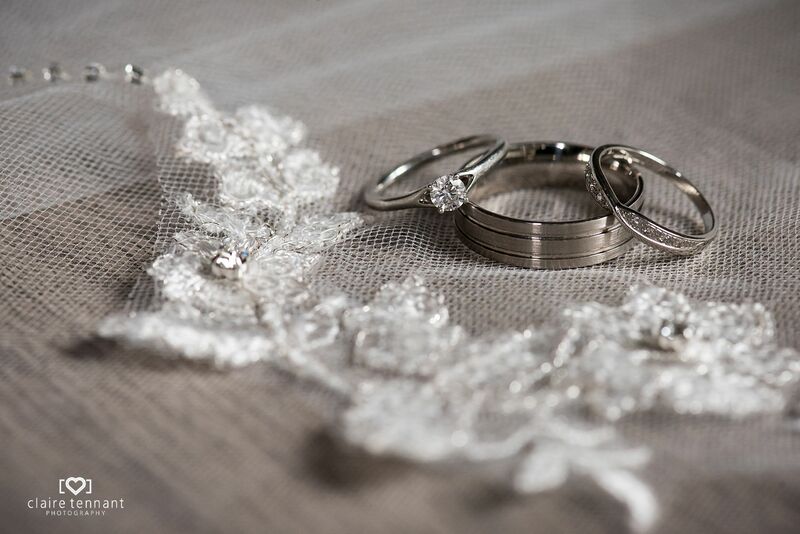 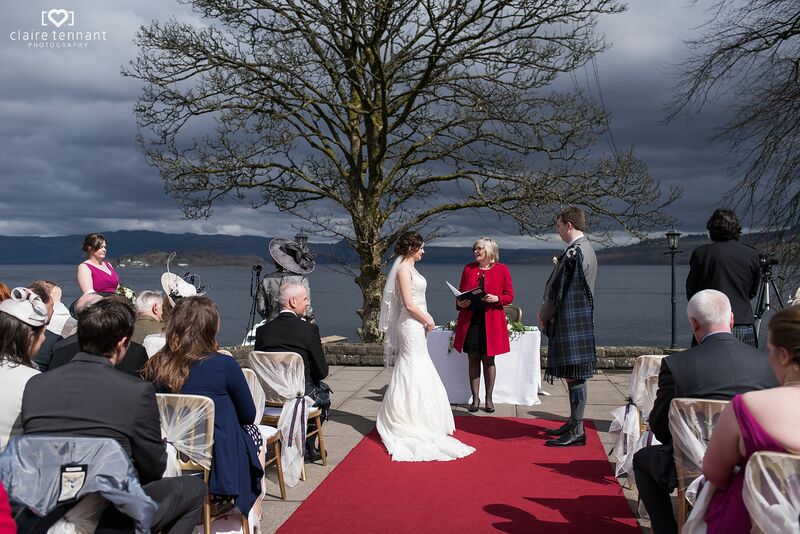 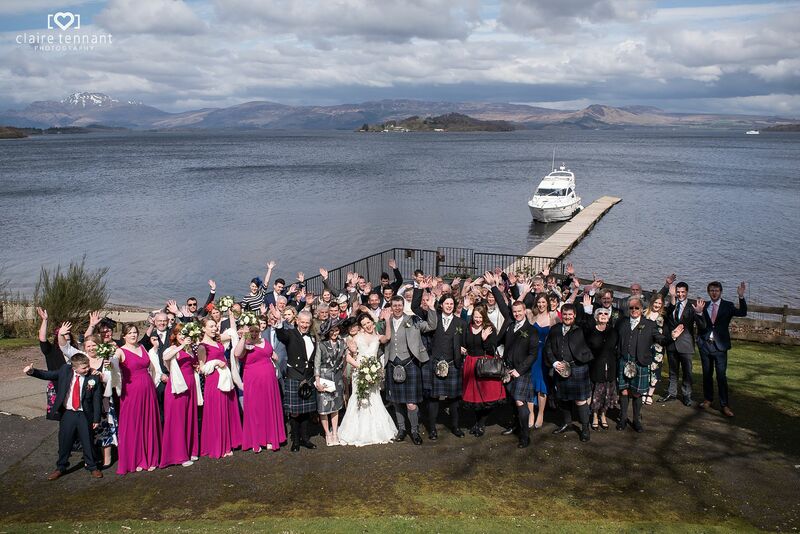 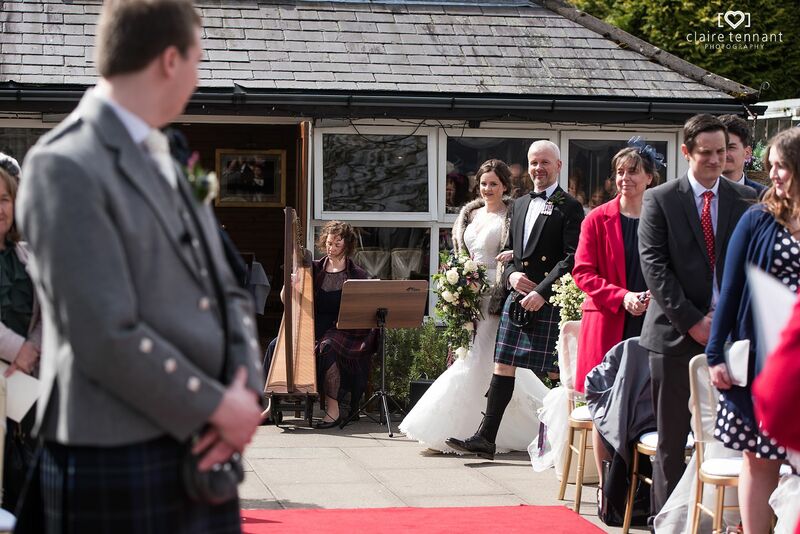 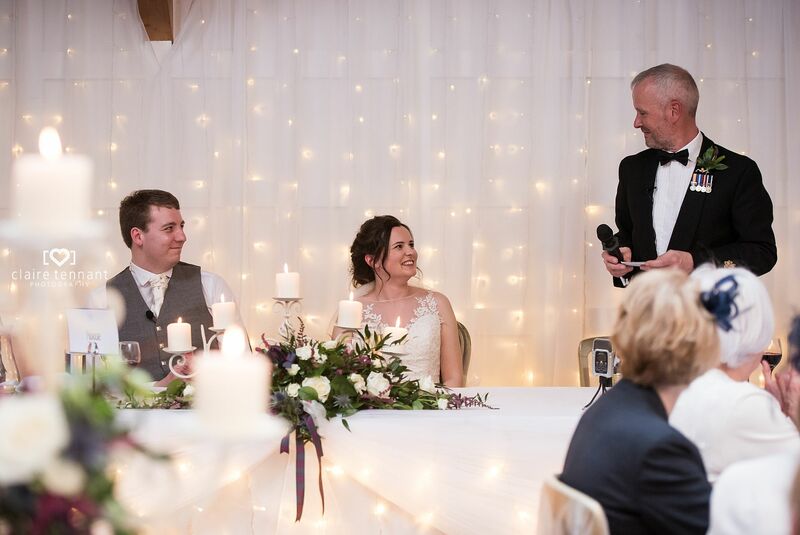 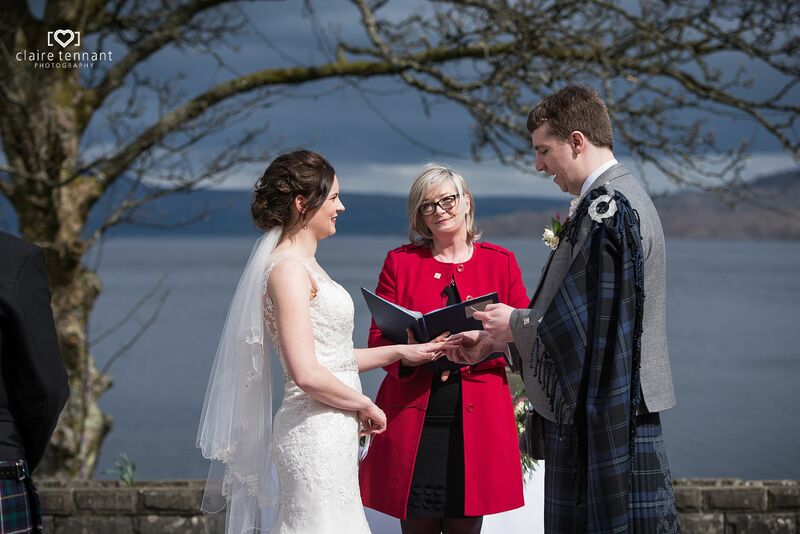 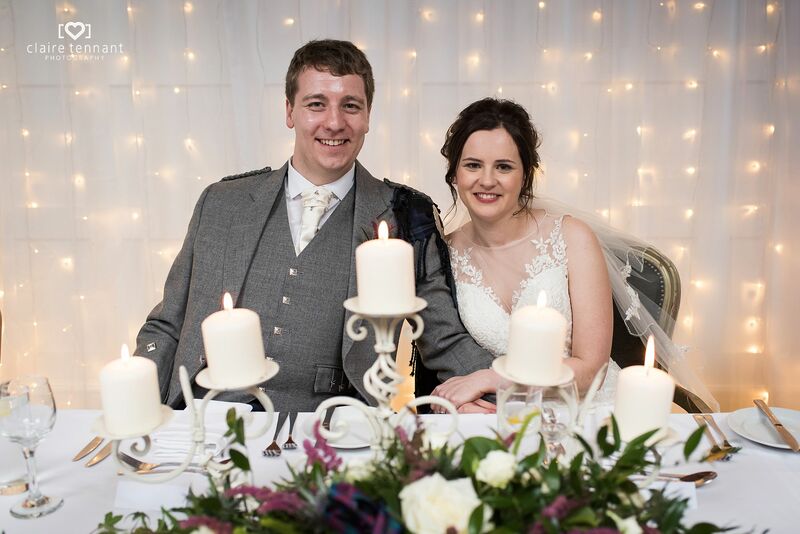 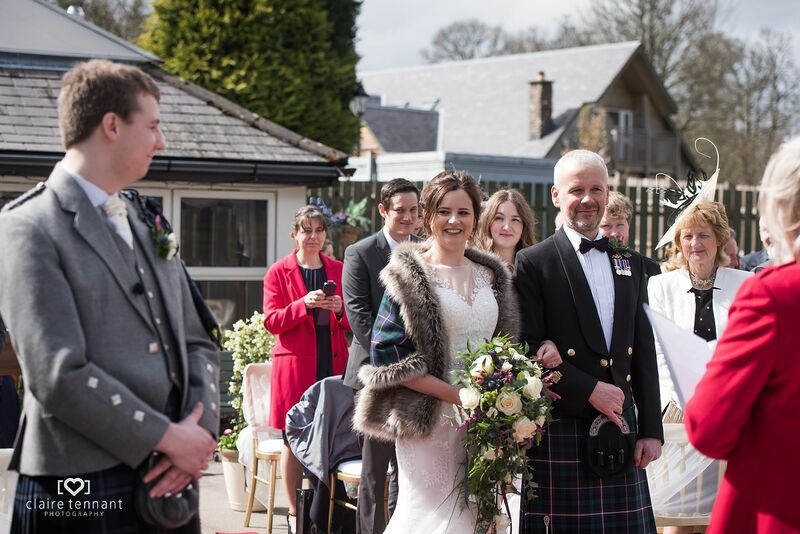 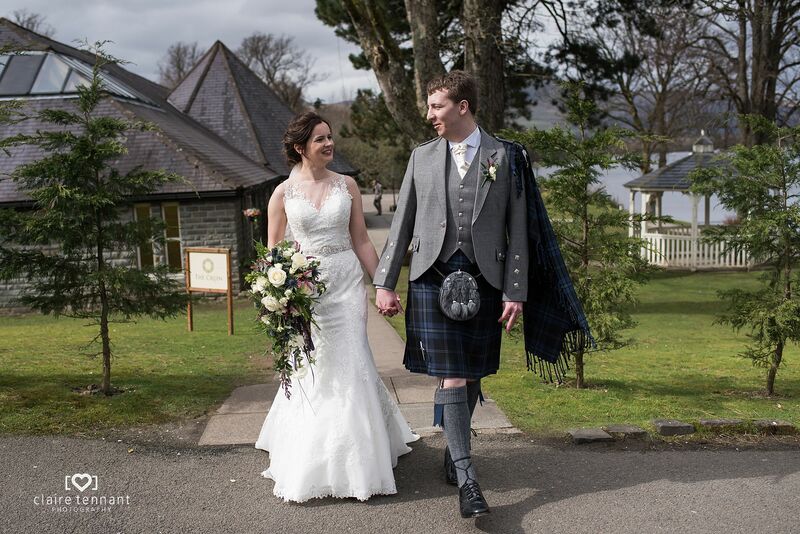 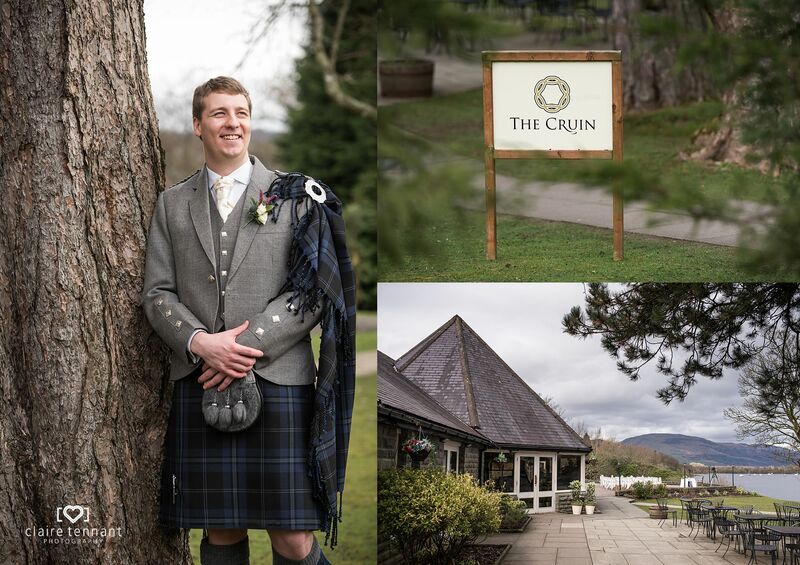 Photographing Hannah and Oliver’s Springtime wedding at The Cruin, Loch Lomond was one of the highlights of last year. 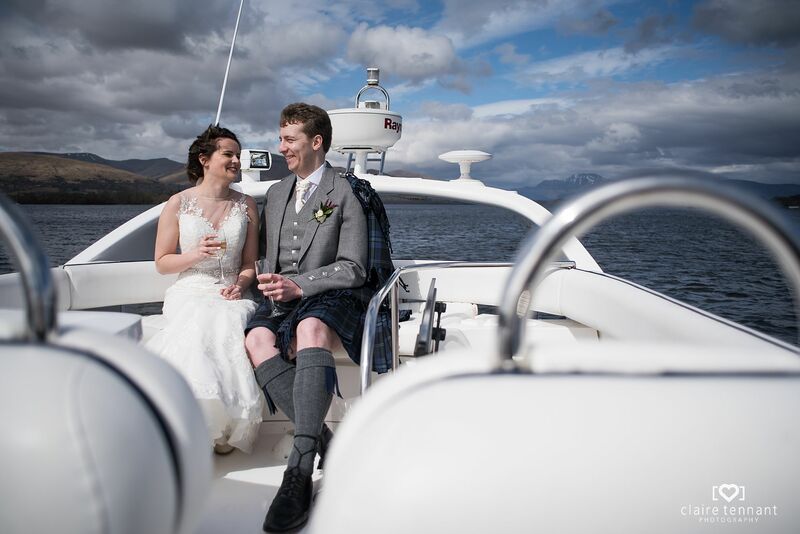 It was extra special and unique as Hannah arrived for the ceremony by yacht much to their guests surprise! 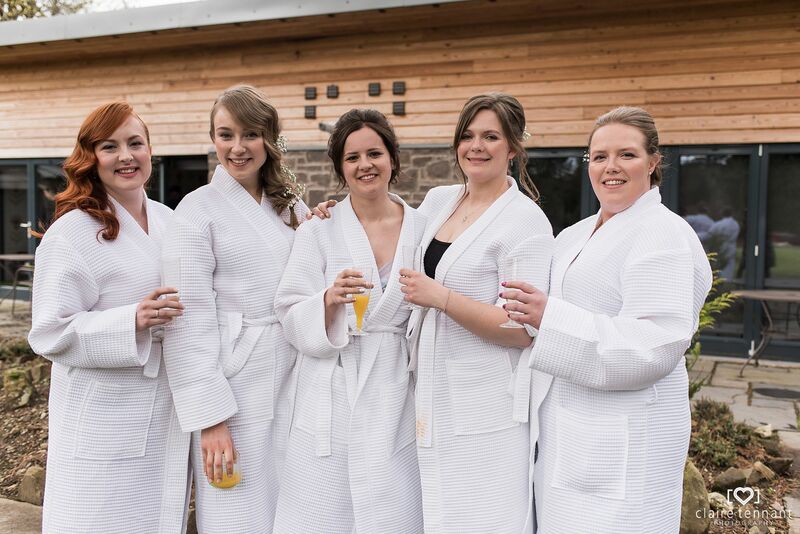 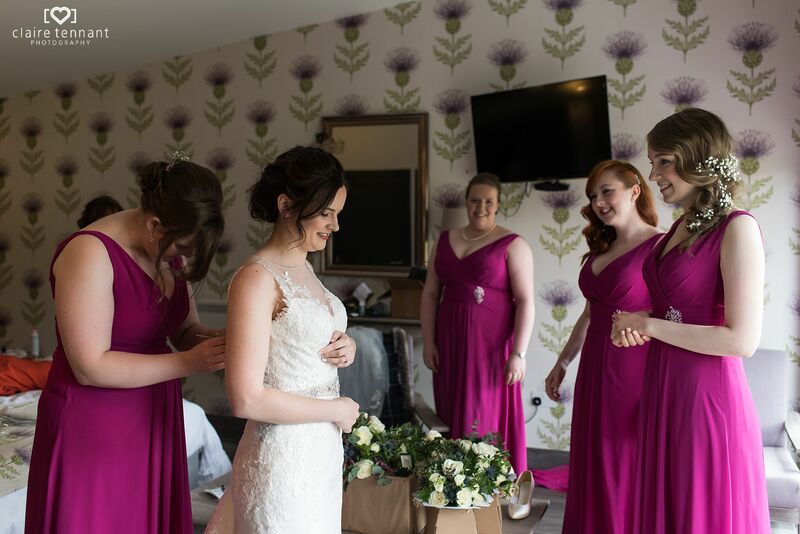 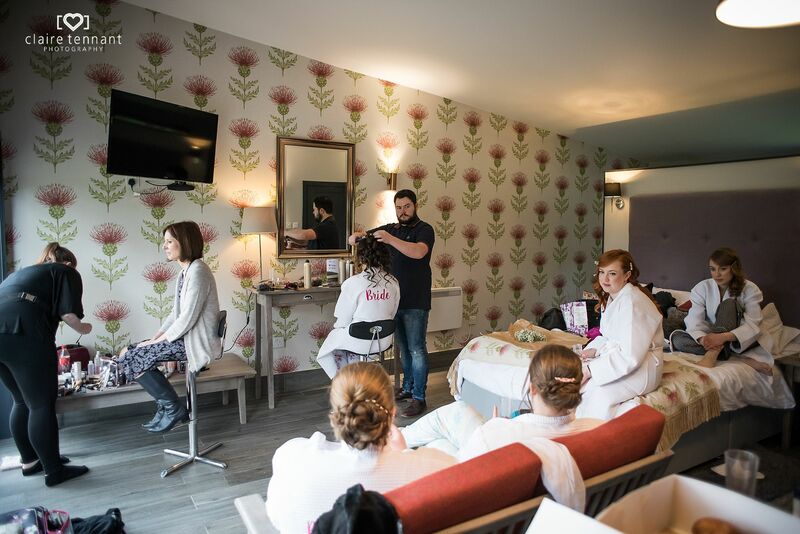 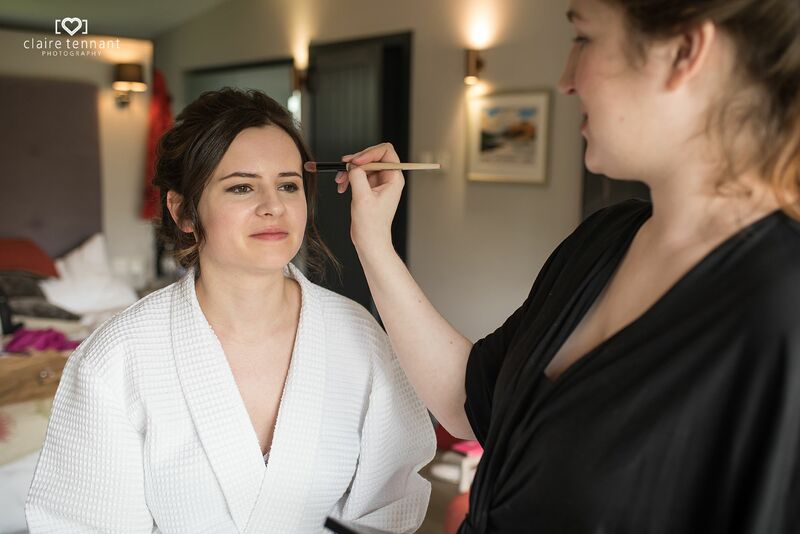 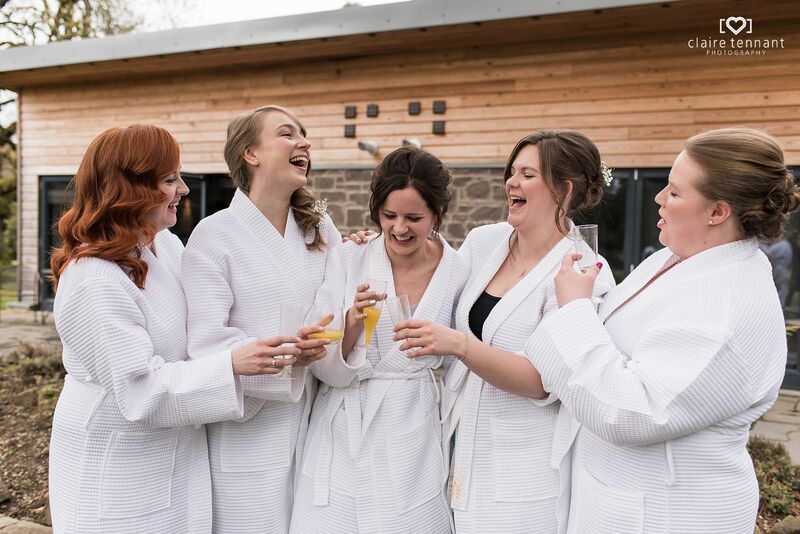 It was a pleasure starting the day photographing Hannah and the girls getting ready at a chestnut lodge just behind the main venue. 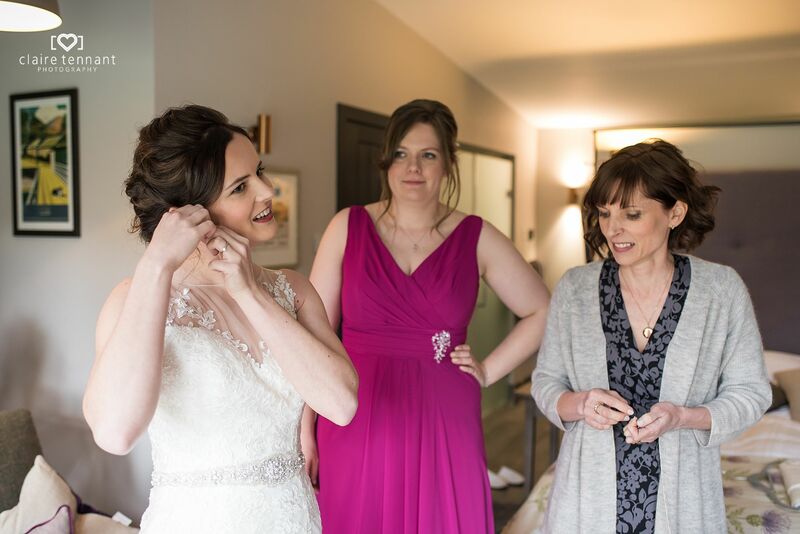 Hannah and the girls had their hair and makeup finished and I photographed the story as it developed. 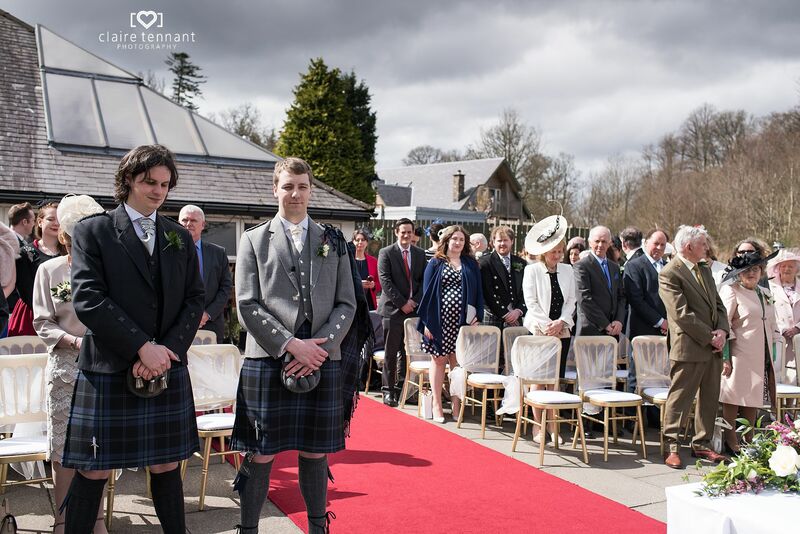 Before the ceremony, guests were seated on the terrace while Oliver waited for his bride. 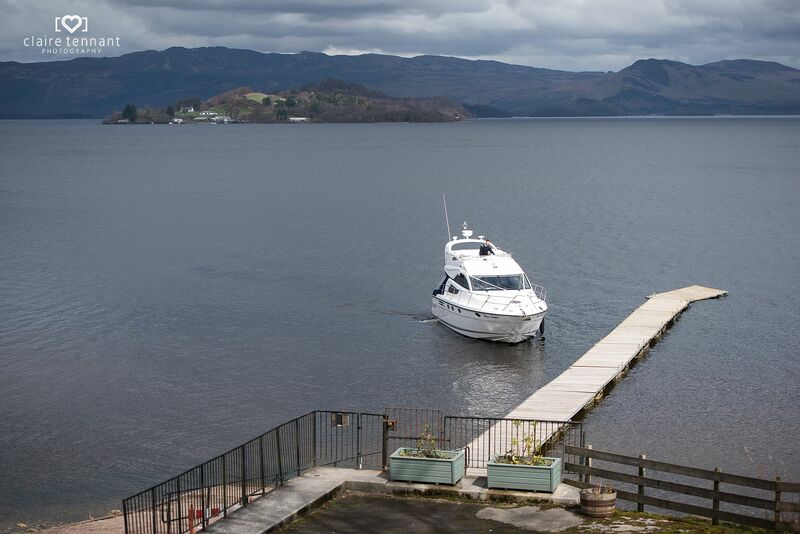 The surprise yacht arrival plans had been hingeing on the weather and thankfully it was dry although a little windy! 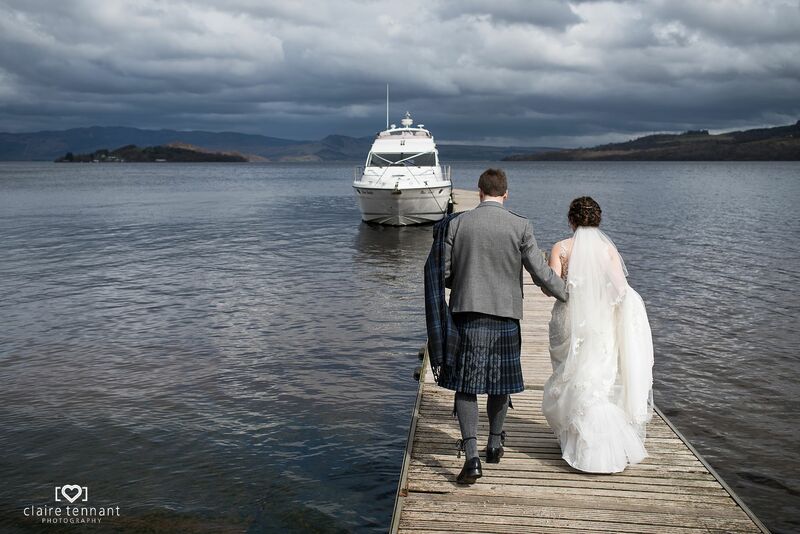 Guests began to realise what was happening as the boat on the horizon came closer and closer until finally mooring on the jetty. 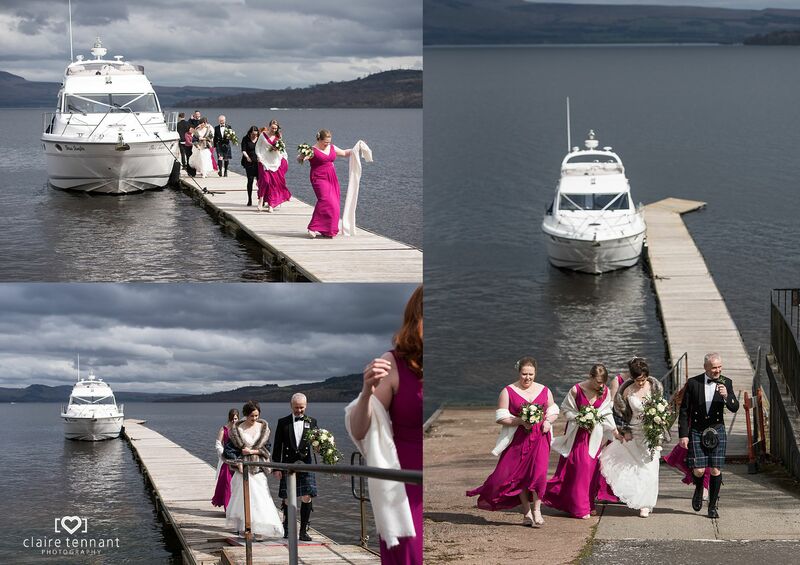 Bride, father of the bride and the bridesmaids got off the yacht and began walking up to the terrace. 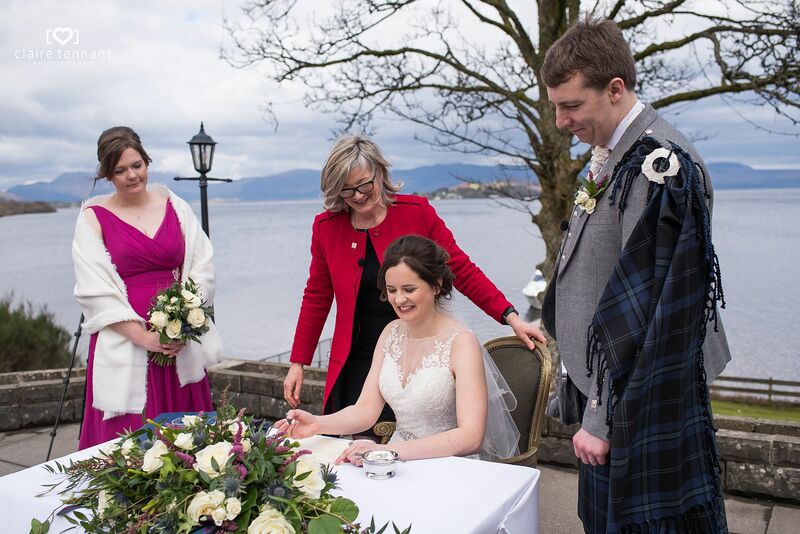 Friends and family looked on as Hannah and Oliver exchanged rings in a personal and emotional ceremony outside on the terrace. 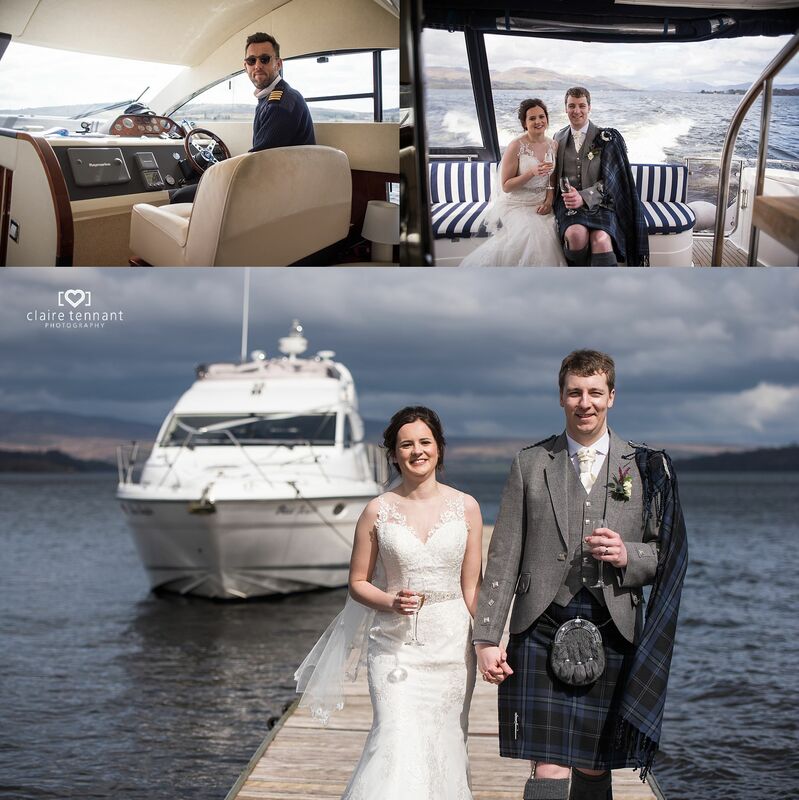 After the ceremony Hannah, Oliver and I went on a private trip on the yacht – Beau Jangles. 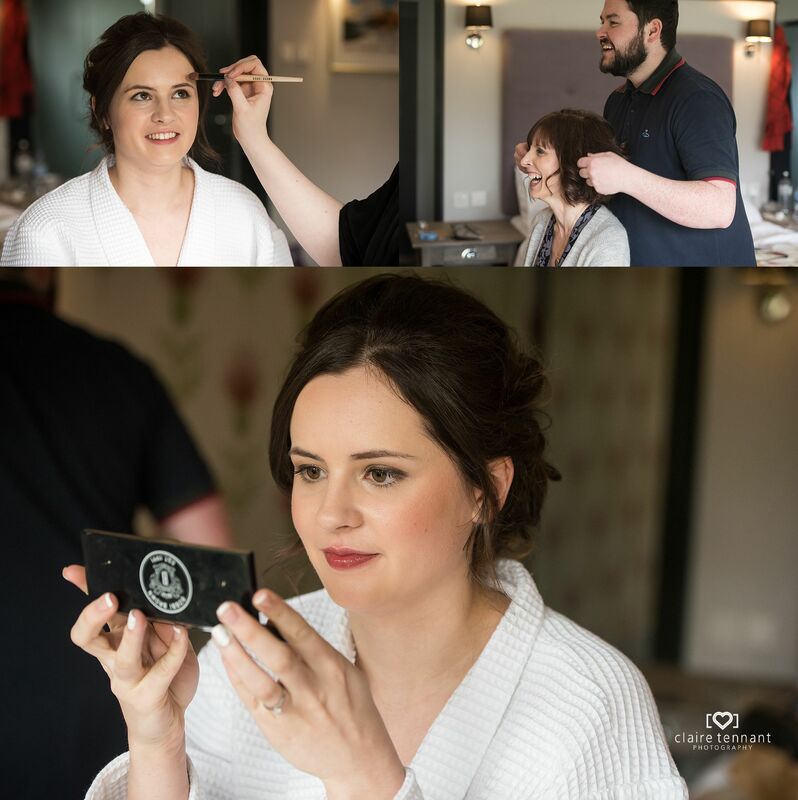 It was an amazing opportunity for me capture some natural photos of them and it also let them relax with a glass of bubbly before the official photos began. 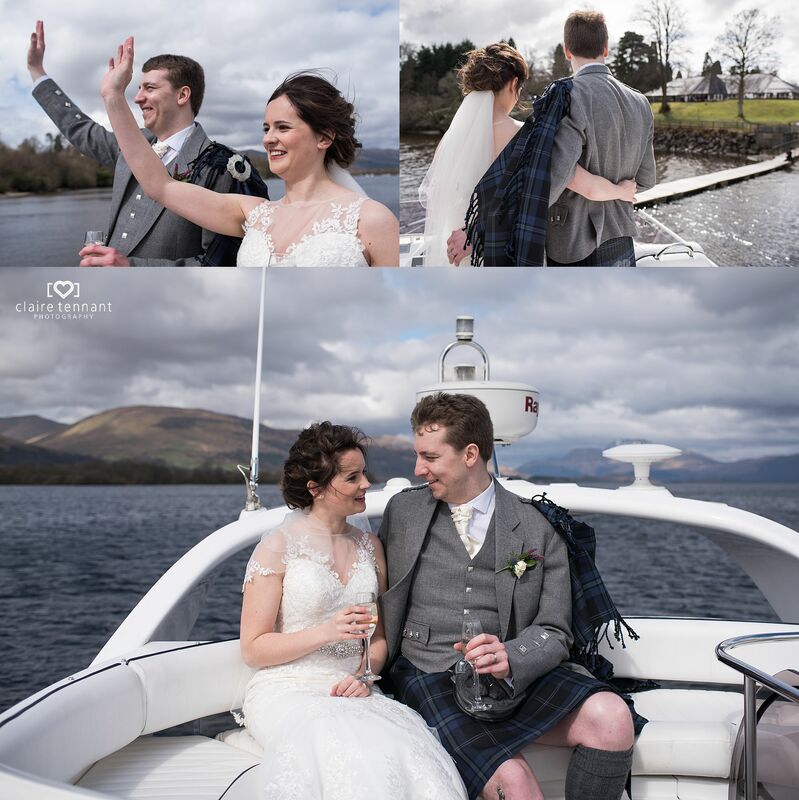 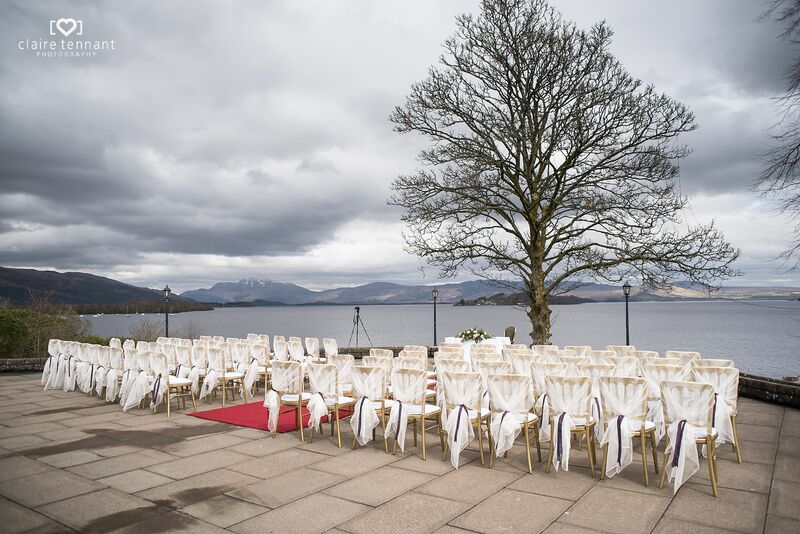 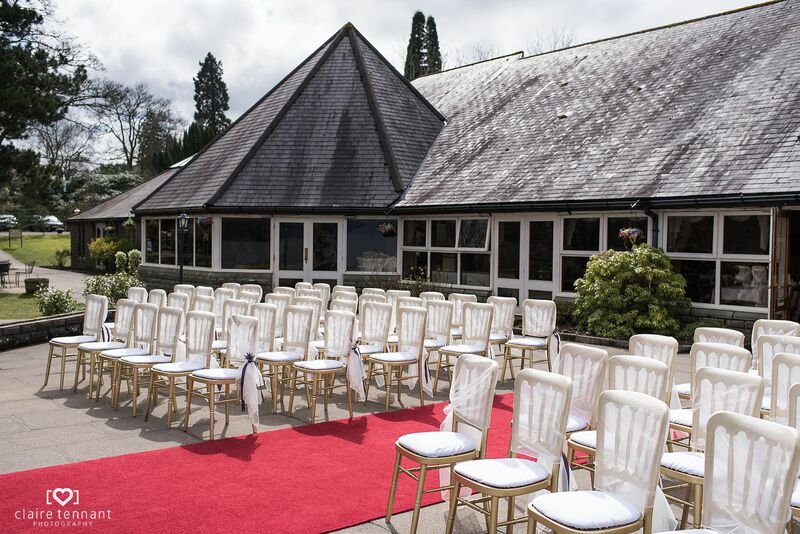 It was a bright and sunny day, which put a smile on everyones faces, and meant we could make the most of the picturesque jetty and other areas outside the venue. 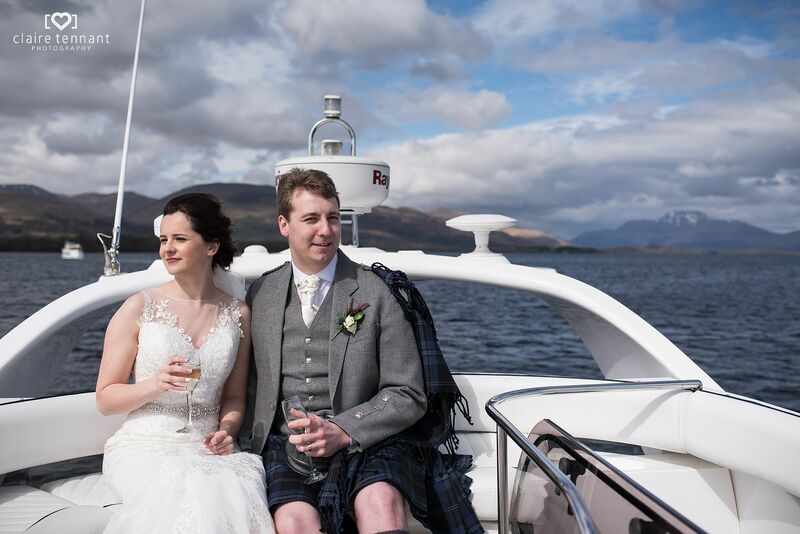 To top it off the boat ran short trips for the guests until the meal started which was a great experience for all. 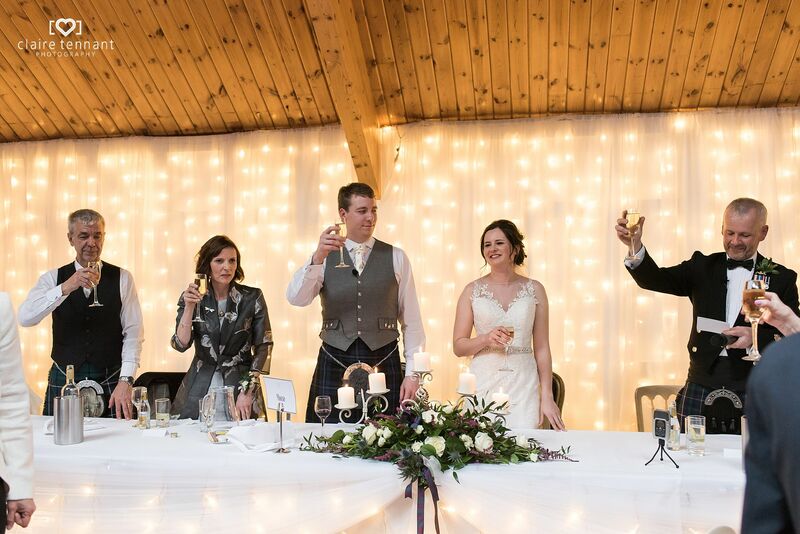 After some lovely, heartfelt speeches it was time for the evening celebrations to begin. 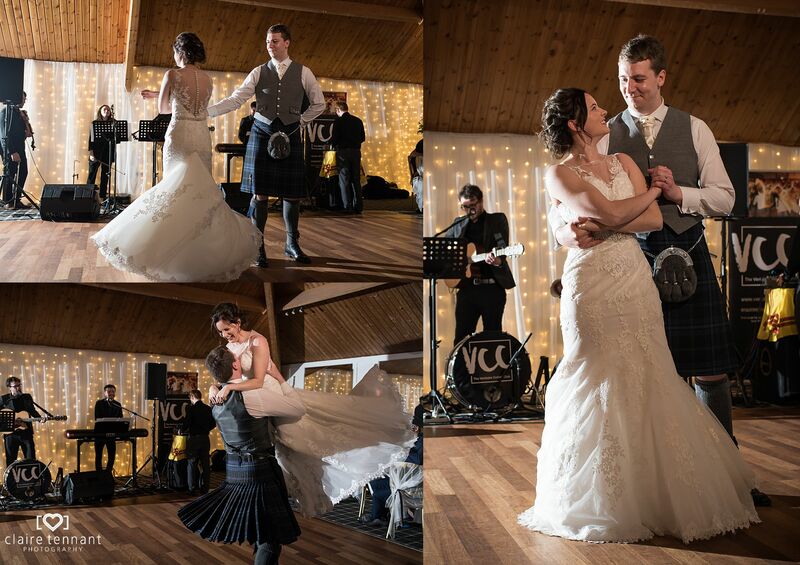 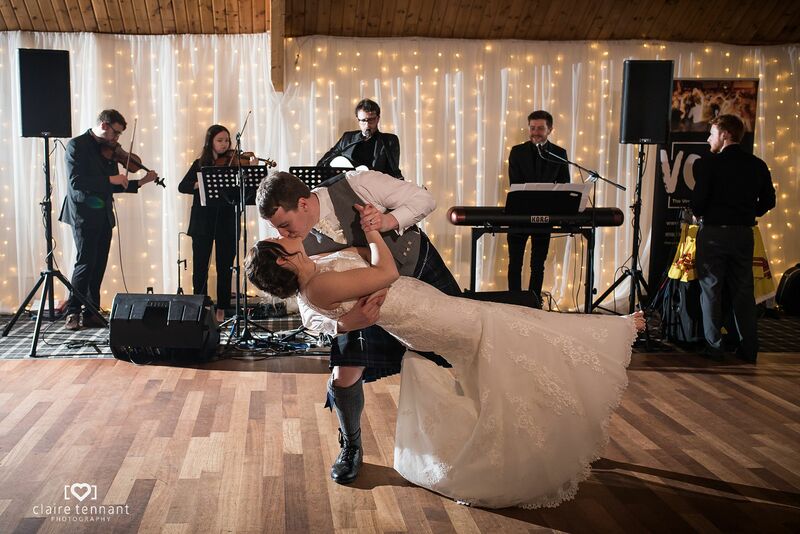 Hannah and Oliver wowed everyone with an amazing choreographed first dance! 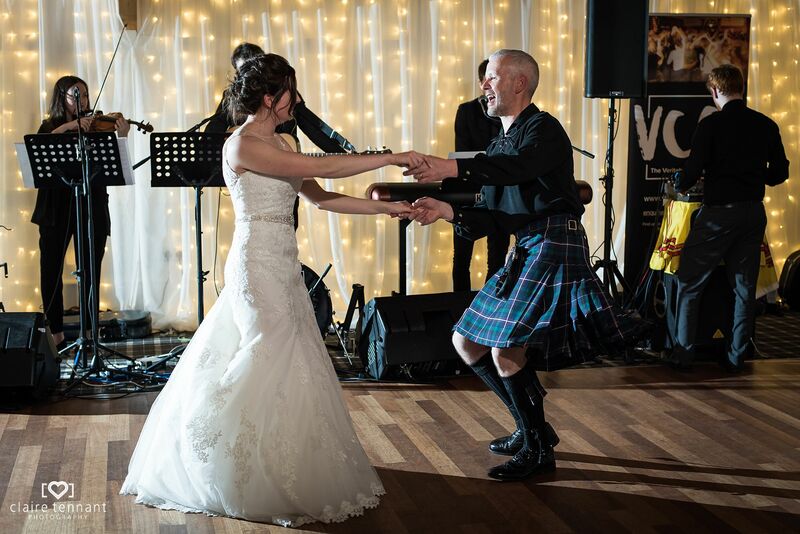 Followed by a lively father and daughter dance and then onto the ceilidh. 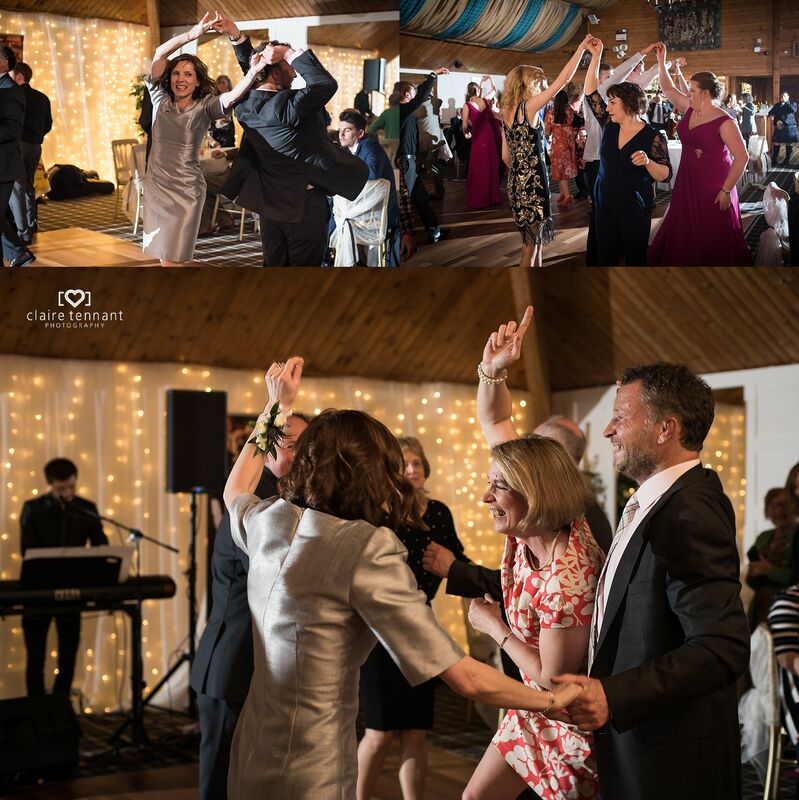 Everyone had an absolute ball on the dance floor! 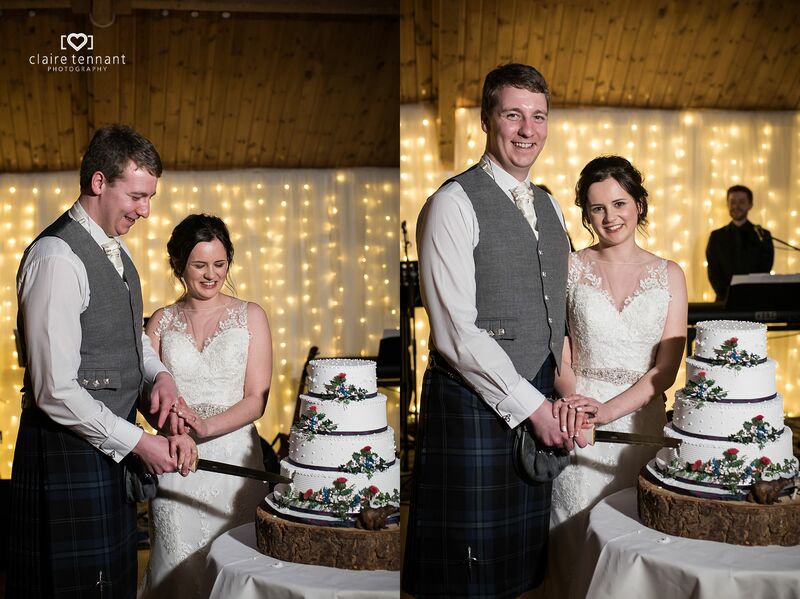 I knew it was going to be a fantastic wedding when Hannah and Oliver booked me to photograph it and it was a joy to share it with them.